Armory is filling a needed niche here with this release. 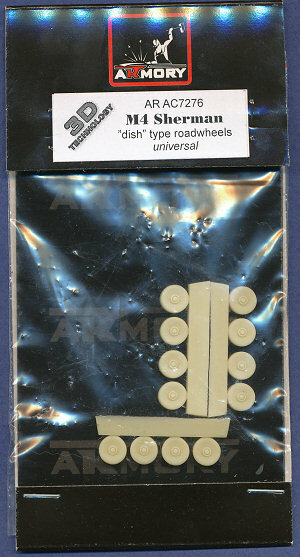 There is not an abundance of the dish-style road wheels available to us, so this is a very welcome set. They measure out perfectly to 1/72nd scale, and are very nicely detailed. I wish they would have included an extra wheel to use as a spare, but not many companies do that. The mounting points in the center of the hub are generic, and can be easily modfied to fit any available Sherman kit.